One of the greatest design events of the year was held in Milan last week, “Salone De Mobile”. Thousands of people gathered into the Italian city to admire works by designers such as Paul Smith, plastics furniture brand Qeeboo, Danish designer Vibeke Fannesberg Schmidt and many more! Having kept an eye on what was happening throughout the week and being very jealous of not being there myself, I have noted down a few of my own “highlights” of the show. One of the exhibitions that caught my eye was “Knoll’s Gold Chair”. 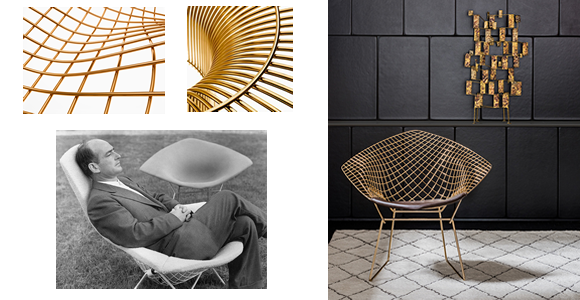 Based on Bertoia’s “Diamond Chair” the furniture designer manufactured the celebrated steel chair in a gold finish to mark Harry Bertoia’s centennial as he would have turned 100 in March. The masterpiece is constructed of welded steel rods and finished with 18 karat gold plating. The frame is then coated with a clear lacquer for protection. 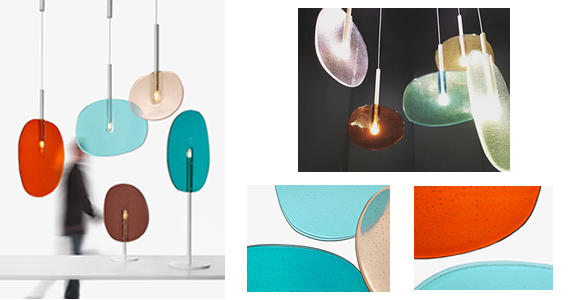 Another designer who caught my interest was Boris Klimek who launched his “Lollipop” light collection. The exhibition was an adaptation of his former “Balloons” collection and the design of the colourful glass lights represent candy lollipops where childhood memories are “captured”. Klimek experimented with the technique of slumped glass, exploring it’s wide possibilities in terms of glass colouring, glint and internal structure. The transparency creates a flow of natural as well as artificial light, creating the “candy” effect. The collection consists of pendant, standing and table lamps all in different shapes and sizes. 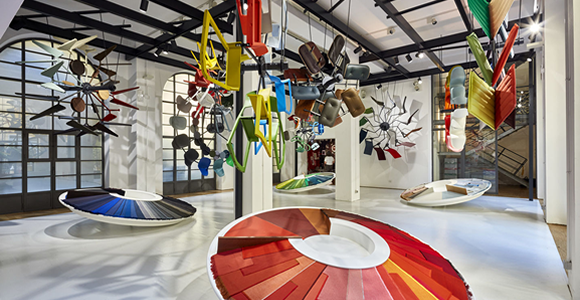 Vitra’s “Colour Machine” was one of the most popular stands during the week. Bright colours and contemporary designs attracted the crowds as the exhibition designers used a playful technique to show off their pieces. 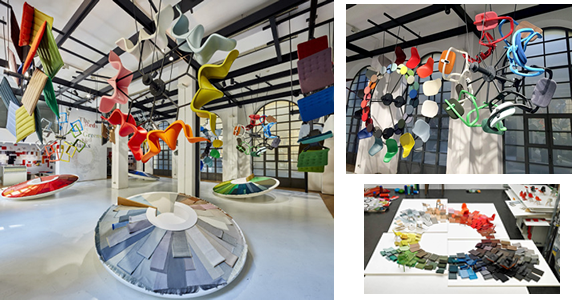 The research project, in collaboration with Dutch designer Hella Jongerius, involved studying the properties and possibilities of the colours, textures, finishes and materials in the company’s product portfolio. The furniture pieces that were part of the display, including the iconic Eames plastic chair, were suspended as wheels from the ceiling as if in space. Having the suspended wheels and spinning tops moving around represented the products “coming to life”, creating a magical and colourful display of timeless furniture pieces. Crystal brand Swarovski debuted their new homeware range at the design show, showing their new line of vases, bookends, candle holders and a centrepiece in honour of Zaha Hadid. 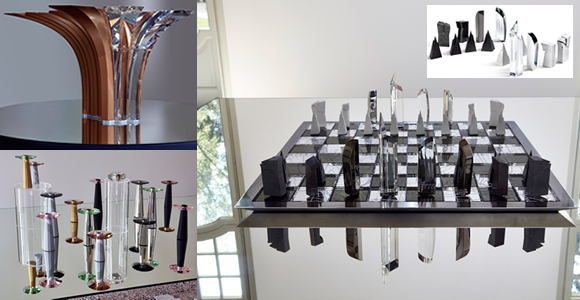 Another beautiful piece that was launched was an architecturally themed chess set, referencing Daniel Libeskind’s studio buildings. A combination of marble, crystal and silver create the chess pieces, with the King resembling the architect’s Freedom Tower in New York. I want one! 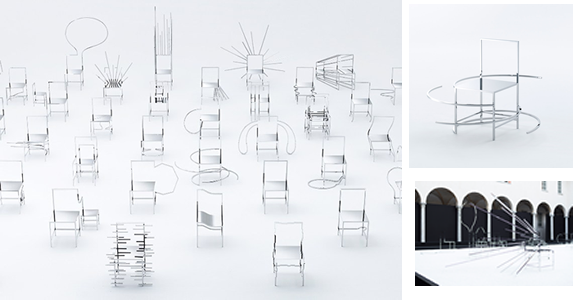 Nendo’s “50 Manga Chairs” was an exhibition that nobody could get enough of! The installation for Friedman Benda drew a comparison between Japanese Manga comics and furniture design. Expressions are created through furniture design, each piece representing an aspect of an emotion or sound. 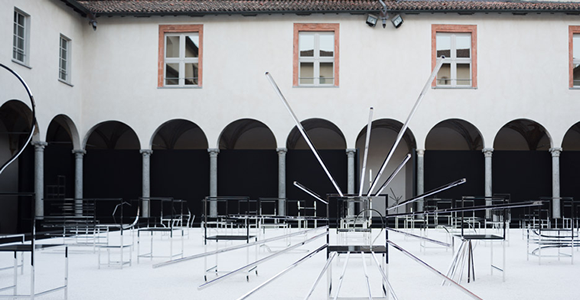 The installation of the exhibition was set up in a historic cloister courtyard, using a historic setting to represent the traditional art of Manga and making a connection with the contemporary design of the chairs. The location emphasised how art and design can timelessly create emotion and expression. Nendo designers have explained that the use of colour is intentionally avoided to ensure that the mirror effect reflects the real World, an element of “realism” that is often put across through the art of Manga. These exhibitions don’t even cover half of the fantastic displays that were at the show this year. I am green with envy for anyone who was able to go! I am definitely going to have to try and get out there next year, I guess I will have to start saving up for the flights… or one of the Manga chairs! I am sure they won’t mind having one of those in our reception area!